First came the book, A Kestrel for a Knave by Barry Hines (1968), then the film directed by Ken Loach (1969). Both are modern classics, still widely available. Surely almost everyone’s read or seen a version of Kes, especially if they live in Yorkshire. So, when Leeds Playhouse presented a stage adaptation by Robert Alan Evans in 2016, I wondered why, and whether it would work. Directed by Amy Leach, I remember it as a small theatrical miracle with an authentic Yorkshire flavour. I jumped at the chance to see the same production, remounted by Martin Leonard, this month. I couldn’t experience again my initial surprise and delight at Evans’s imaginative adaptation, but I anticipated an excellent evening’s entertainment. It certainly retains the seamlessly episodic, fast pace of the original production. Evans’ tight script captures the essence of Kes as I remember the film and book; honest, direct and moving. It makes the audience work hard to be part of the experience, and that’s no bad thing. There are just two actors, and the bird is imagined. 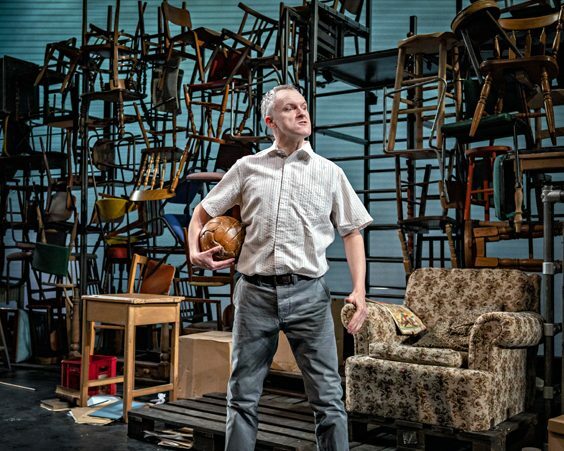 On a set dominated by a wall of chairs, artfully designed by Max Johns to look chaotic and rather perilous, a disturbed, middle-aged Billy Casper finds his old falconer’s glove and slips it on, reviving memories of the most important time in his life. Together, the man and the ghost of his childhood relive 15 year-old Billy’s brief escape from his everyday miserable existence – as he takes a young kestrel and learns to train it. 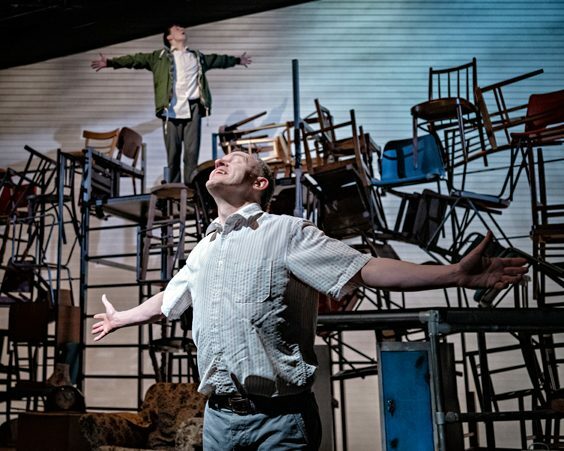 One of the most significant moments in this production is when both Billys climb up the perilous ‘hill’ of chairs to get a bird’s eye view of their mining town. They know it’s a dismal place but for now, they’re above it all and free, tasting fresh air. It resonates when the young lad, awed by the flight of a kestrel, is gripped by the desire to train it. I understood his need. A few more such moments of relief from the furious pace of this performance would have helped me to savour even more the exhilaration and sorrows of Billy’s journey. Lucas Button is the 15 year-old South Yorkshire lad, Billy Casper. When I say he ‘is’ Billy, I mean it. He looks pale, malnourished, uncared for. His guarded but still innocent eyes tell the story of his youth so far – neglected by his promiscuous mum, bullied by his older brother and crushed by most of his teachers. His first faltering attempts to ‘swing the lure’ for the bird he calls Kes are totally believable; the sparkling eyes in his pale face when he masters the swing, joyous. The sad climax of his time with the wild bird is poignant. We identify with his spiritual journey – even if ‘uz Yorkshire fowlk’ aren’t totally convinced by his South Yorkshire accent. Jack Lord reprises his 2016 role as the older Billy, and all the characters that still haunt him. It’s a mammoth challenge for an actor to transform from mother to brother to shopkeeper in the blink of an eye, without so much as a pinnie to help him. Lord is most effective as the older Billy, a timeworn, rather haggard man who can nevertheless laugh at himself at 15. He and Button neatly echo each other’s gestures and have great rapport. His ‘mother’ is a delight, too. More changes in mannerism and vocal range might have added to the fun of character transformation but each character was distinct enough. Both actors clamber over Max Johns’ set to good effect; be they climbing hills, chasing one another or fleeing some everyday trauma. 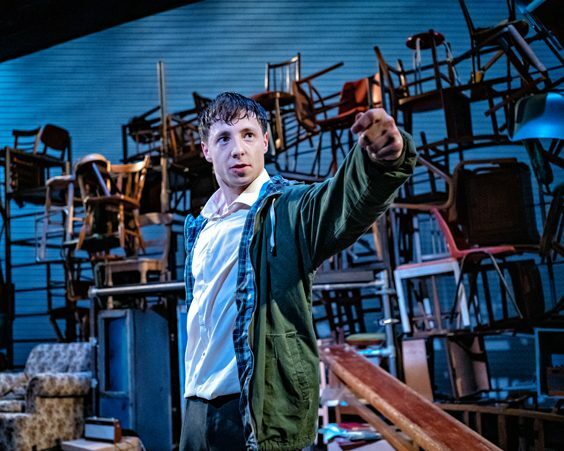 But while the wall of chairs cleverly symbolises the obstacles in Billy’s life, it restricts the depth of the Pop-up’s acting area – which is already shallow. So, despite Button’s outstanding acting, I never quite felt with young Billy the sense of space and freedom that releases him spiritually as he watches Kes glide and flutter and swoop, the sense that there’s a different world out there even if the barriers to it are enormous – and I never ‘saw’ the bird as I did in the original production. Much as I enjoyed this remodelled Kes, it didn’t take me to the highs or lows I remember from 2016.